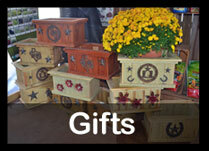 We have your seasonal gift needs covered with our unique selection of items for Spring, Summer, Fall and Christmas. 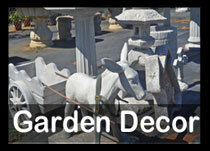 In Spring and Summer, Bunnies, Butterflies, Dragonflies and Bird themed gifts fill our store in a variety of stakes, statues, garden stones and birdbaths. As Autumn approaches, more country home décor, roosters and scarecrows accent the store and finally with the arrival of the holidays, our entire store is transformed into a Christmas Wonderland filled with unique themed trees and holiday gifts.